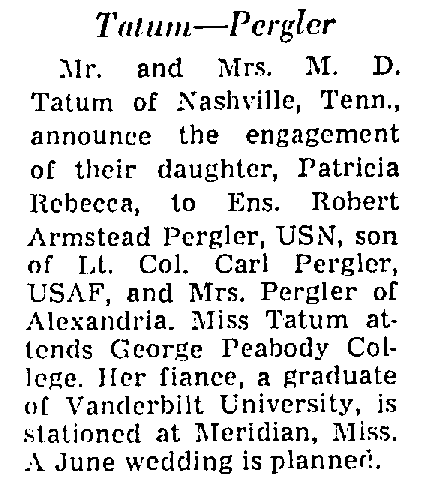 "Mr. and Mrs. M. D. Tatum of Nashville, Tennessee, announce the engagement of their daughter, Patricia Rebecca Tatum, to Ensign Robert Armstead Pergler, U.S. Navy, son of Lutienant Colonel Carl Pergler, U.S. Air Force, and Mrs. Pergler of Alexandria, Virginia." "Miss Tatum attends George peabody College." "Her Fiance, Robert Armstead Pergler, a graduate of Vanderbuilt, is stationed at Meridian, Mississippi." "A June 1967 wedding is planned."